Transcript: Welcome to MyBinding.com. These are the WorkSaver Big 8-tab Multicolor Dividers on Buff Paper from Avery. 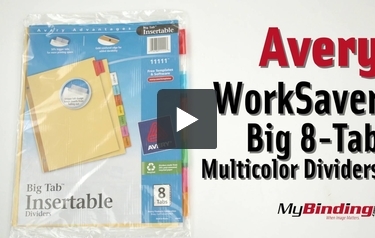 Color coordinate your binders with big, easy to read multicolor dividers. This set of 8 dividers comes with a printable sheet of labels for use with Avery.com templates. Each divider is made with Buff Paper and has a double-sided gold reinforcing strip to resist tearing. The tabs are specially made to hold the label securely and flex with the paper to not rip. Great organization made easy with Avery. Welcome to MyBinding.com. These are the WorkSaver Big 8-tab Multicolor Dividers on Buff Paper from Avery.